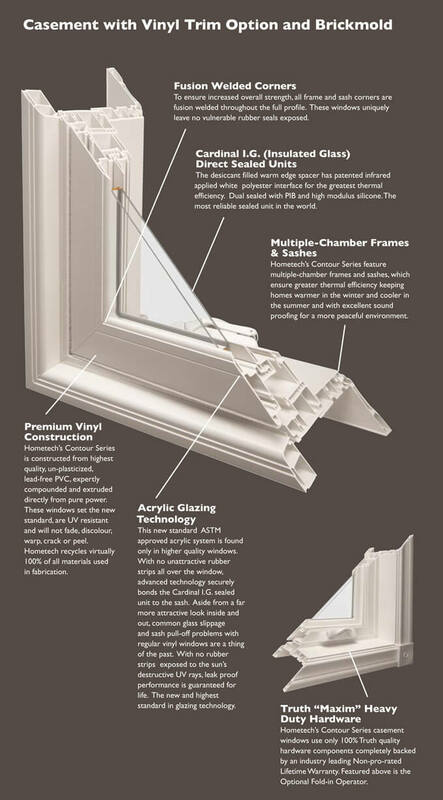 The Contour series represents the new generation of vinyl window design because it is designed to render the softness and finished elegance of traditional finely crafted wooden windows. What does a contour design mean for windows? Most windows in the market have black rubber around the glass which wears and tears and melts down from the heat of summer. We have eliminated the use of black rubber and replaced it with vinyl contour design, making it trouble free while creating an elegant and finely crafted wood look to your window(s). The second feature of contour design is the use of sliders and double hung windows outdoors in order to change the square look and give both beauty and sophistication in harmony with the front of the window. Did you know most outside windows are painted with our standard popular colours such as sandalwood and cream and are cap stocked for durability (Co-extrusion Technology).